Lung squamous cell carcinoma (LUSC) accounts for a significant proportion of lung cancer and there have been few therapeutic alternatives for recurrent LUSC due to the lack of specific driver molecules. 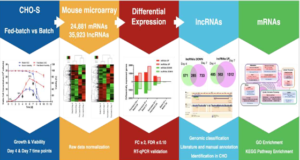 To investigate the prospective role of lncRNAs in the tumorigenesis and progression of LUSC, researchers at Guangxi Medical University calculated aberrantly expressed lncRNAs based on The Cancer Genome Atlas RNA-seq data. 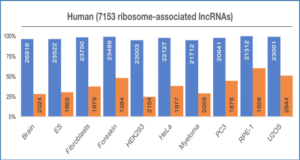 Of 7589 lncRNAs with 504 LUSC cases, 884 lncRNAs were identified as being aberrantly expressed (|log2 fold change| >2 and adjusted P<0.05) by DESeq R. The top 10 lncRNAs with the highest diagnostic value were SFTA1P,LINC00968, LINC00961, LINC01572,RP1-78O14.1, FENDRR, LINC01314,LINC01272, GATA6-AS1, and MIR3945HG. 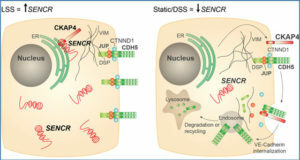 In addition to the significant roles in the carcinogenesis of LUSC, several lncRNAs also played vital parts in the survival and progression of LUSC. SFTA1P, LINC01272, GATA6-AS1 and MIR3945HG were closely related to the survival time of LUSC. Furthermore, LINC01572 and LINC01314 could distinguish the LUSC at early stage from that at advanced stage. 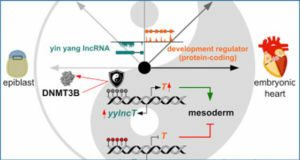 The prospective molecular assessment of key lncRNAs showed that a certain series of genes could be involved in the regulation network. Furthermore, the OncoPrint from cBioPortal indicated that 14% (69/501) LUSC cases with genetic alterations could be obtained, including amplification, deep deletion and mRNA upregulation. More interestingly, the cases with genetic alterations had a poorer survival as compared to those without alterations. 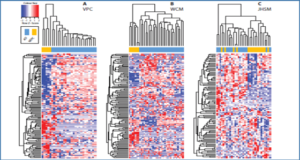 Overall, the study propounds a potentiality for interpreting the pathogenesis and development of LUSC with lncRNAs, and provides a novel platform for searching for more capable diagnostic biomarkers for LUSC. 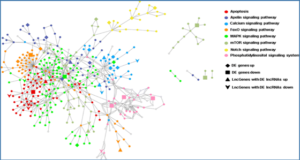 To explore the regulation network of the key lncRNAs, the co-expressed genes of those key down-regulated lncRNAs were screened out by WGCNA. 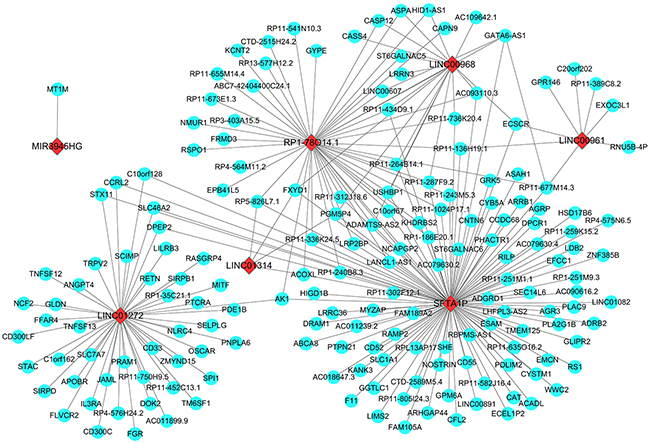 Red diamonds showed the key lncRNAs and blue balls are for key lncRNAs co-expressed mRNAs.